2014 is going to be a weird year for Nicolas Cage. To be fair though, every year in recent memory has been weird for the star of such hits as Con Air and Raising Arizona. It seems every time a good role comes his way it is follow by 2-9 films that make absolutely no sense beyond offering him a paycheck. Sometimes that’s all it takes, I guess. Later this year Nic Cage will join Chad Michael Murray and a few other faces you’ve sort of forgotten by now in the remake of the adaptation to the best-selling Left Behind series. 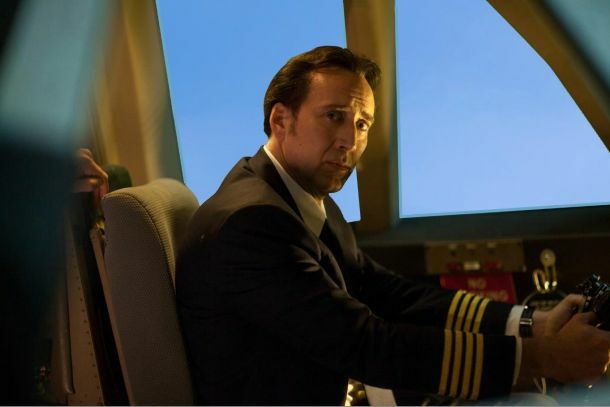 Cage plays a pilot who, along with others left behind following the resurrection of Christ, must face existence with the knowledge they have essentially been damned for all eternity and must now walk the Earth without any hope of God/Jesus/etc. looking out for them. No trailer is available yet, but yesterday the first footage and latest promotional imagery for the feature were released. Starting with the clip, our first look at Left Behind offers almost no insight into what the world would be like without the presence of an omnipotent overseer. Instead, viewers get a chance to see Nic Cage offer some acting chops while discussing his recent separation from his wife. He claims she chose Jesus over him, but does not go into detail about what that means or why it drove a knife into their marriage. The poster released alongside the clip is an utter disaster. We have seen some pretty horrific photoshop hatchet jobs over the years, but this one is by far the worst. You can view the footage and promotional image below. As we mentioned in the beginning, the reboot of Left Behind does not currently have a release date. There are rumors it will be out before summer, but unless a trailer debuts soon that seems highly unlikely. We’ll bring you more information as additional details begin to surface.